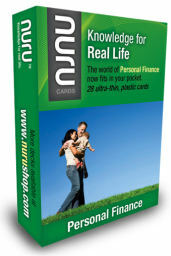 THIS IS THE LAST GIVEAWAY of the Nuru Personal Finance Cards. The first one is closed, but you also have time to enter the second giveaway by subscribing to my RSS feed or to my email updates. So how do you enter this one? Well, you need to leave a comment, but not just any comment. You need to provide one personal finance goal for 2009 in the comments below. How hard is that? If it’s not a goal, I delete the comment. You have until Noon, Friday, December 5, 2008 to enter. That’s 26 hours from when I published this post. THIS CONTEST HAS ENDED. I WILL ANNOUNCE THE WINNER WHEN THEY CLAIM THE PRIZE. THANKS TO ALL WHO ENTERED! Goals can be things like “increase savings by X% or $X”, “increase side income by $X”, “Start a Roth IRA”, etc. Sure, you can just say anything here, but I’ll trust that you’re entering an honest goal that you will work towards in 2009. Enter by leaving a comment on this post. The comment must include a personal finance goal for 2009. If it doesn’t, I will delete it. You must leave a valid email address in the email box or else I cannot contact you if your number is drawn. I will use a random integer generator to pick the winning comment number. I will give the winner 24 hours to claim their prize before drawing a new number. One goal of mine for 2009 is to save up an emergency fund, which I do not have yet. My first step of the goal will be to get $500 in my ING online savings account, and a $200 cushion in my checking account. My first goal for 2009 is to get a solid amount in my savings. I’m in between jobs right now, although I expect to be employed by this time next week (fingers crossed) and am running through my savings at an alarming rate. I expect to get a substantial tax refund this year and hope to be able to put all of it into savings, in addition to saving 300-500/month out of my salary. My primary goal is to buy a home in about a year, and I want to have more than I need in savings at that time. My number 1 goal is to cut all the unnecessary expenses and apply the extra money to debt. I have lots of goals for the 2009. 🙂 I’ll be graduating with my MS in Physics and getting a real job soon, so my first goal will be to start an IRA and do matching of the 401K if the company has it (maxing them both out). Besides that, I have a few thousand saved from teaching at my uni, but I’m hoping to get a real emergency savings built up, I’m hoping from what I have and the salary I’ll be making that I’ll be able to save 2 months before 2010 hits, but my final goal is 6 months. Increase my net worth by 20%. I want to save $1500 for a vacation in November with my leftover money each month, as well as presents, unexpected money, my 2008 tax rebate (this is what will probably make it do-able, as I am getting my stimulus check with my rebate), etc. Really, I just don’t want to spend any of the money I already put into savings on this–it makes me sad to see my regular savings go down. One of our finance goals for 2009 is to get our mortgage balance low enough that we can eliminate the PMI on our mortgage!!! I can’t wait until that happens…. if all goes as planned, this should occur by mid 2009! My financial goal for 2009 is to take on no more school debt (for my wife, now that she’s the one in school), and make an extra $100-per-month payment on the outstanding balance. My goal for 2009 is to pay off at least one of my credit cards. 1. Pay off all credit card debt. 2. Add $2000 to savings. 3. Boost 401K by 2%. 4. Max out 529 for my two children. One of my 2009 goals is to get my credit card debt/avail credit ratio down to 10%. Currently sitting at 23%, and it was as high as 47% in Jan 2008 when I started focusing on paying it down. My goal for 2009 is to be 100% debt free before June. 1. Open a Roth IRA for DH. For 2009 my goal is to religously stick to the budgets I make for myself! Not over or under spending. I always found it difficult to allocate money exactly where I plan to allocate money but after making my own software, I really think that I’m going to succeed this year! Woohoo! If I can reach all of those, I’ll be in great shape! My goal for 2009 is to max out my Roth IRA!